Brooklyn Park, MN – Squid Ink Manufacturing, Inc., a leading manufacturer of superior quality inks and inkjet printing equipment, introduces the new CoPilot® Flex Inkjet Printing System. Squid Ink’s CoPilot Flex printing system is designed to print superior quality hi-resolution characters, razor-sharp text, real-time information, scannable bar codes, and great looking logos on pulp, foam, or PET egg cartons at 135ft/min. CoPilot Flex is engineered for simple integration on existing egg packing lines. 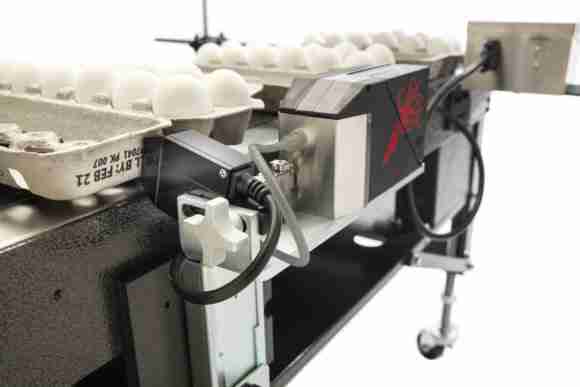 The system’s compact design allows for narrow mounting in nearly every zone of an egg packing process, eliminating the need for after-market engineering or modifications to conveyors. CoPilot Flex’s small printhead is designed to adjust to match the slope of the egg carton and is capable of inverting the user’s message, meaning the CoPilot Flex can print on the end of the carton in the open or closed carton zone. The system also features a convenient 200ml snap-in ink cartridge for quicker fluids changeover. A 4.3”full-color touchscreen provides access to the system’s internal messages and print functions. Messages are created and edited on Squid Ink’s easy-to-use Orion™ PC software and transferred via USB, Ethernet, wireless, or optional Windows® tablet. The 10.1” tablet is ideal for users who want message creation and editing capabilities on the production floor. For multiple print locations, an unlimited number of CoPilot Flex printing systems can be connected via Ethernet or wireless network and controlled through one central Orion PC. The CoPilot Flex can be ordered to run either oil or solvent-based inks to print up to .7” of hi-resolution characters, razor-sharp text, scannable bar codes, and great looking logos at 185 dpi. Additionally, Squid Ink has developed a specially formulated ink for the egg industry, SI-PZ4200, a solvent-based inkjet ink designed and tested for excellent adhesion properties on pulp, foam, and clear PET egg cartons. Squid Ink operates as a part of Engage Technologies Corporation, parent company of Squid Ink, Eastey, AFM, and Cogent Technologies. Eastey (www.eastey.com) is a leading manufacturer of heavy-duty shrink packaging equipment and automated case sealing systems for packaging applications. American Film & Manufacturing (www.afmsleeves.com) manufactures and supplies shrink sleeves and shrink labeling solutions. Cogent Technologies (www.cogent-tech.com) manufactures infrared drying systems used to dry ink in the industrial and graphics industries.